Now, first things first, we should clarify: when we say that the hearings were canceled, it’s just that. The immigration hearing was canceled, but the case itself was not. Not to worry, the estimated 60–80,000 immigration hearings that were canceled will still be heard! However, it may take a while. At the end of November of last year, a backlog of over 800,000 active immigration cases had built up. Each of those canceled hearings represents another case that wasn’t processed, which means the backlog has continued to grow. Further, there wasn’t a good way to simply shift back immigration hearings when the shutdown ended. This means that any hearings that got canceled during the shutdown are effectively moving to the end of the list. For many, that means waiting an additional 2–3 years for a new court date. Since most applicants have already been waiting multiple years, it’s an incredibly frustrating scenario. Unfortunately, there isn’t really a way to move up your immigration hearing if it was canceled and rescheduled. Immigration courts are doing what they can to work with those who were affected, but their already-busy schedules mean there isn’t much in the way of wiggle room. As difficult as it may be, try not to worry. A canceled immigration hearing may be a blessing in disguise. While it does mean waiting longer for the new court date, the postponement also means more time to prepare. Immigration judges have been more stringent about hearings during the current presidential administration, so that extra time can be invaluable. Use that time to gather additional evidence to help build a strong case for a claim of status. The more evidence you can provide, the better qualified you will appear. In addition, the delay of time means more time spent in the U.S. while you wait for the new hearing date. In some cases, this may occasionally open up new immigration statuses that you may not have been eligible for previously. It’s a great idea to work with an immigration lawyer — someone who knows the ins and outs of the U.S. immigration system — to help you prepare as thoroughly as possible. The additional time is a double-edged sword. In some cases, it means more time to prepare, which is a blessing. However, the alternative is that immigration policies may change. If that happens, some individuals who were previously eligible for immigration may no longer qualify under a particular visa. 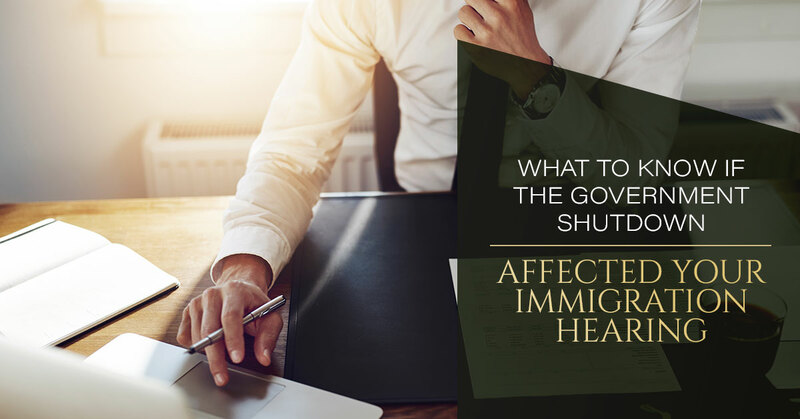 In these cases, it’s important to have a trusted immigration lawyer who can help navigate the changes. The best thing you can do if your immigration hearing was canceled is to connect with an immigration lawyer. We keep abreast of the changes to immigration policy so we can better advise you about your individual case. If you’re in New York City or the surrounding areas, start by scheduling a consultation with the immigration law team at Zohar Law today. Immigration law and government policies regarding visas, the right to work and deportation. Backed by years of knowledge and experience, the immigration lawyers at Zohar Law Firm in Manhattan provides unparalleled legal services that protect the rights of those immigrating to this country. Find out what makes us the chosen firm of New York families. Covering all matters of immigration law, including visa assignment, green cards and deportation, the legal team at Zohar Law firm in Manhattan is prepared to handle all immigration issues with creativity and personalized attention to best suit your needs. Operating out of the World Trade Center in New York City, the Zohar Law Firm welcomes those who look to become US citizens and those who prefer to work and live here. Within close proximity to the immigration building and courthouse in lower Manhattan, we support the highly-diversified population of the region with pride. From assistance with visa applications to help with deportation issues, our client-focused legal team is now taking new clients. Please contact us for a comprehensive legal consultation. We are the preferred team of immigration attorneys serving an international clientele.